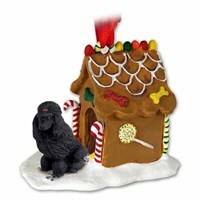 Deck your halls and trim your tree with this sweet and colorful Poodle Gingerbread House Christmas Ornament Black. 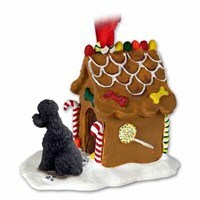 Our Poodle Gingerbread House Christmas Ornament Blacks are crafted from fine quality stone resin and feature a beautiful full color figurine. All of our Christmas ornaments are crafted for a lifetime of memories and make wonderful gifts, and these beautiful Poodle Gingerbread House Christmas Ornament Black are no exception. Deck your halls and trim your tree with this sweet and colorful Poodle Gingerbread House Christmas Ornament Black Sport Cut. Our Poodle Gingerbread House Christmas Ornament Black Sport Cuts are crafted from fine quality stone resin and feature a beautiful full color figurine. All of our Christmas ornaments are crafted for a lifetime of memories and make wonderful gifts, and these beautiful Poodle Gingerbread House Christmas Ornament Black Sport Cut are no exception. Deck your halls and trim your tree with this sweet and colorful Poodle Gingerbread House Christmas Ornament Chocolate Sport Cut. Our Poodle Gingerbread House Christmas Ornament Chocolate Sport Cuts are crafted from fine quality stone resin and feature a beautiful full color figurine. All of our Christmas ornaments are crafted for a lifetime of memories and make wonderful gifts, and these beautiful Poodle Gingerbread House Christmas Ornament Chocolate Sport Cut are no exception. 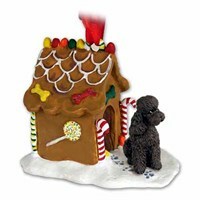 Deck your halls and trim your tree with this sweet and colorful Poodle Gingerbread House Christmas Ornament Gray. Our Poodle Gingerbread House Christmas Ornament Grays are crafted from fine quality stone resin and feature a beautiful full color figurine. All of our Christmas ornaments are crafted for a lifetime of memories and make wonderful gifts, and these beautiful Poodle Gingerbread House Christmas Ornament Gray are no exception. Deck your halls and trim your tree with this sweet and colorful Poodle Gingerbread House Christmas Ornament Gray Sport Cut. Our Poodle Gingerbread House Christmas Ornament Gray Sport Cuts are crafted from fine quality stone resin and feature a beautiful full color figurine. All of our Christmas ornaments are crafted for a lifetime of memories and make wonderful gifts, and these beautiful Poodle Gingerbread House Christmas Ornament Gray Sport Cut are no exception. 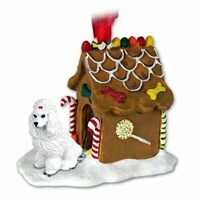 Deck your halls and trim your tree with this sweet and colorful Poodle Gingerbread House Christmas Ornament White. 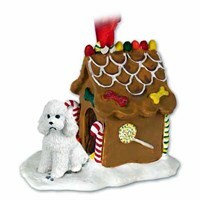 Our Poodle Gingerbread House Christmas Ornament Whites are crafted from fine quality stone resin and feature a beautiful full color figurine. All of our Christmas ornaments are crafted for a lifetime of memories and make wonderful gifts, and these beautiful Poodle Gingerbread House Christmas Ornament White are no exception. 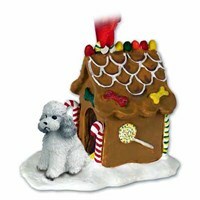 Deck your halls and trim your tree with this sweet and colorful Poodle Gingerbread House Christmas Ornament White Sport Cut. 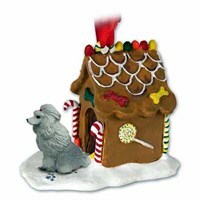 Our Poodle Gingerbread House Christmas Ornament White Sport Cuts are crafted from fine quality stone resin and feature a beautiful full color figurine. All of our Christmas ornaments are crafted for a lifetime of memories and make wonderful gifts, and these beautiful Poodle Gingerbread House Christmas Ornament White Sport Cut are no exception. 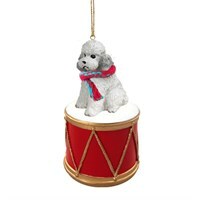 Add a touch of holiday cheer to your decor for years to come with this charming Little Drummer Poodle Gray Christmas Ornament. The perfect stocking stuffer for everyone on your nice list, this adorable Ornament stands approximately 3-3.5 inches tall and is made to last out of durable Stone Resin. Hand Painted by skilled artisans with a fine eye for detail, friends and family will simply love receiving this Little Drummer Poodle Gray Christmas Ornament as a thoughtful gift from you this hoiday season. This magnificent Poodle Christmas Tree Ornanment will enlighten any Christmas Tree. 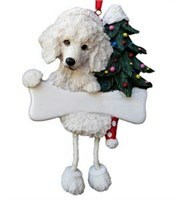 Our Poodle Ornament has a dog bone name-plate that can be personalized with the name of your beloved Poodle. 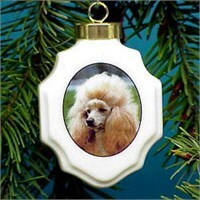 This great Poodle Christmas Ornament will brighten up any Christmas tree. Let everyone know that your four legged friend is an important part of the family. Each Santa's Little Pals Poodle Christmas Ornament comes with a red ribbon to hang from the tree and its own own gift box. This adorable Poodle Christmas Ornament is approximately 3.5 inches tall. This magnificent Poodle Christmas Tree Ornanment (Black) will enlighten any Christmas Tree. Our Poodle Ornament has a dog bone name-plate that can be personalized with the name of your beloved Poodle. 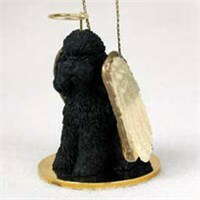 This great Poodle (Black) Christmas Ornament will brighten up any Christmas tree. Let everyone know that your four legged friend is an important part of the family. Each Santa's Little Pals Poodle Christmas Ornament comes with a red ribbon to hang from the tree and its own own gift box. This adorable Poodle Christmas Ornament is approximately 3.5 inches tall. There's no mistaking which breed is peering out from this darling Poodle Christmas Ornament! It's one of those looks that can stop you in your tracks and make you laugh. Gosh, the furry breed is downright adorable, aren't they? This Poodle Christmas Ornament captures all of that cuteness and more; the Poodle Christmas Ornaments do so by being crafted from premium poly resin and are hand painted. The Christmas Ornaments are perfectly designed to swing on a tree branch and add even more fun to your holiday festivities! 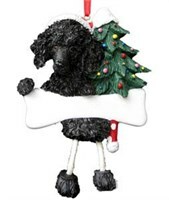 There's no mistaking which breed is peering out from this darling Poodle Christmas Ornament (Black)! It's one of those looks that can stop you in your tracks and make you laugh. Gosh, the furry breed is downright adorable, aren't they? This Poodle Christmas Ornament (Black) captures all of that cuteness and more; the Poodle Christmas Ornament (Black)s do so by being crafted from premium poly resin and are hand painted. The Christmas Ornaments are perfectly designed to swing on a tree branch and add even more fun to your holiday festivities! Celebrate the charms of your very best friend this holiday season with this beautiful Poodle Personalized Dog Bone Christmas Ornament Apricot Sport Cut. This masterfully Hand Painted Ornament shines on a high quality 2.5 w x 1.75 h Stone Resin Bone that makes the ideal gift for friends and family alike. Personalize-It-Yourself with your dog's name and create happy holiday memories for years to come. Celebrate the charms of your very best friend this holiday season with this beautiful Poodle Personalized Dog Bone Christmas Ornament Black. This masterfully Hand Painted Ornament shines on a high quality 2.5 w x 1.75 h Stone Resin Bone that makes the ideal gift for friends and family alike. Personalize-It-Yourself with your dog's name and create happy holiday memories for years to come. Celebrate the charms of your very best friend this holiday season with this beautiful Poodle Personalized Dog Bone Christmas Ornament Chocolate Sport Cut. This masterfully Hand Painted Ornament shines on a high quality 2.5 w x 1.75 h Stone Resin Bone that makes the ideal gift for friends and family alike. Personalize-It-Yourself with your dog's name and create happy holiday memories for years to come.